Based on the novel A Painted Devil by Thomas P. Cullinan, The Beguiled is the story of a wounded Union soldier who is taken in to an all-girl’s school in Mississippi during the American Civil War where he finds himself in serious trouble due to his infatuation with some of the women at the school. Directed by Don Siegel and screenplay by Albert Matz and Irene Kamp, the film is an exploration of temptation where a small school filled with women and young girls deal with a man in the house as their intentions to help him suddenly goes wrong. Starring Clint Eastwood, Geraldine Page, Elizabeth Hartman, and Jo Ann Harris. The Beguiled is an entrancing yet gripping film from Don Siegel. Set during the American Civil War at a remote all-girl’s school in rural Mississippi, the film follows a wounded Union soldier who is found by a young girl and brought to the house where he is to tended and rested despite the reluctance of its headmistress. It is a film that play into the sense of temptation and the struggle to help someone even though he is the enemy and could possibly kill them. Though there are some good intentions at first from both sides, it is clear that things are going to go wrong due to not just temptations but also for the sense of longing and anguish. The film’s screenplay by Albert Matz and Irene Kamp, with re-writes by Claude Traverse, doesn’t just explore the reluctance of the school’s headmistress Martha Farnsworth (Geraldine Page) in taking in this wounded Union soldier in Corporal John “McBee” McBurney (Clint Eastwood) but also how his arrival seems to disrupt a certain status quo in the school that is kind of isolated from everything else. Throughout the course of the story, there are glimpse of who Farnsworth and McBurney really are through flashbacks as the former seems to have something as it relates to her reluctance in bringing McBurney in while the latter is shown as someone who isn’t he says he claims to be. Still, he manages to charm one of the teachers in Edwina Dabney (Elizabeth Hartman) who is reluctant to express her feelings due to her own history with men while one of the school’s older students in Carol (Jo Ann Harris) wants him for herself. Though Farnsworth initially wants to turn McBurney in to the Confederates, she would eventually see his worth as it eventually leads to a very complicated web of lust and temptation. It would lead into this very chilling third act where it is about power but also anguish and regret over what had happened. There is also this theme about innocence loss as it relates to the young girl Amelia (Pamelyn Ferdin) who would be the one to find the wounded McBurney as she thinks he’s a good man yet would see some of the darkest aspects of humanity. Don Siegel’s direction is definitely intoxicating in terms of its Southern Gothic setting with its evocative usage of super-imposed dissolves and dream-like tone. With many of its exteriors shot on location near Baton Rouge, Louisiana with interiors shot at soundstages at Universal Studios in Los Angeles, California. The film does play into this world of the American South during the Civil War where it is quite tense but also has something that is quaint in its location where these women are in a world that is completely isolating from the chaos of war though it’s happening a few miles away. Siegel’s usage of close-ups are quite intense as it relates to the drama as well as in the suspense where it would come to ahead for its third act. The direction would also have these moments where Siegel would create these flashbacks that play into the past of both McBurney and Farnsworth as it is quite dream-like but also unsettling. One notable sequence during the film’s second act involves a surreal dream sequence as it relates to temptation. The sequence also has a little moment where it is also quite taboo for its time which adds to this air of surrealism but also would lead to a key plot-point that would change the film’s tone into something much darker. Some of the camera movements that Siegel makes with the crane shots definitely have an air of beauty from the way he shoots scenes on the roof of the house overlooking the landscape to a shot directly at the stairs. There are also moments in the film that are unsettling during the third act but also would have an air of innocence in one sequence relating to Amelia as it goes back to what she was doing at the beginning of the film. Another aspect of the film that is unique which also plays to its dream-like tone is the usage of voiceovers as it showcases the thoughts and temptations of the characters and how it would undo them leading to this very intense climax which is really a battle of dominance. Overall, Siegel crafts a very eerie and ravishing film about a Union soldier taking advantage of the hospitality of women at an all-girl’s school in the South. Cinematographer Bruce Surtees does amazing work with the film’s cinematography with its usage of sepia-drenched film stock for the film’s opening and closing shots as well as the usage of candle lights and natural lighting for some of the interior scenes set at night. Editor Carl Pingitore does excellent work with the editing with its stylish usage of jump-cuts and dissolves to help play into the drama and suspense. Production designer Ted Haworth, with set decorator John P. Austin and art director Alexander Golitzen, does brilliant work with the look of the many rooms inside the house as well as some of the exteriors of the house where Farnsworth runs her school. Costume designer Helen Colvin does nice work with the costumes in the way the women dress during those times as well as the ragged clothes of McBurney. The sound work of John L. Mack and Walden O. Watson is terrific for some of the natural elements presented on location with a few sound mixes to help intensify some of the suspenseful moments in the film. The film’s music by Lalo Schifrin is fantastic for its orchestral-based score that is calm at times but also eerie and unsettling which help play into the drama and suspense as it is one of the film’s major highlights. The casting by Robert J. Lasanka is marvelous as it feature some notable small roles from Charles Briggs as a Confederate captain, George Dunn as a Confederate soldier, Matt Clark as a Confederate militia, and Patrick Culliton as Farnsworth’s brother from the flashbacks. Other noteworthy small roles include Pattye Mattick and Darleen Carr in their respective roles as the teenage students Janie and Doris who don’t like McBurney because he’s a Yankee while Melody Thomas and Peggy Drier are wonderful in their respective roles as the young students Abigail and Lizzie. Pamelyn Ferdin is excellent as Amelia as a young girl who would be the one to discover McBurney as she befriends him while trying to comprehend some of the things he does as a man. Mae Mercer is brilliant as the African-American maid/slave Hallie who is charmed by McBurney but also becomes aware of how troubling his presence is as she isn’t sure if some of the things he says are true. Jo Ann Harris is fantastic as the 17-year old seductress Carol as a young woman with a crush on McBurney as she would do whatever she can to claim McBurney for herself as well as cause trouble. Elizabeth Hartman is amazing as Edwina Dabney as a virginal teacher that is groomed to become the school’s headmistress as she becomes torn for her love for McBurney and devotion to the school as it is a very heart-wrenching performance from Hartman. Geraldine Page is incredible as Martha Farnsworth as a school headmistress who is trying to maintain order in her school as she is reluctant to heal McBurney where she is intrigued by him as it relates to the loss she carries as it’s a very dark but compelling performance from Page. Finally, there’s Clint Eastwood in a phenomenal performance as Corporal John “McBee” McBurney as a wounded Union soldier that is tended to as he charms the women around him yet would cause trouble with his presence as well as his own desires as a man as it is a very dark performance from Eastwood. 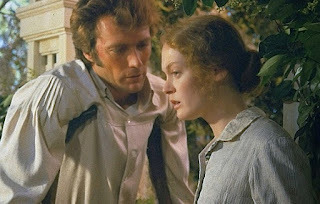 The Beguiled is a tremendous film from Don Siegel that features great performances from Clint Eastwood, Geraldine Page, and Elizabeth Hartman. Along with a brilliant supporting cast, gorgeous visuals, a gripping story, and a chilling music score, the film is definitely an intense suspense-drama that explores temptation and anguish during the American Civil War. In the end, The Beguiled is a sensational film from Don Siegel. An unusual film. The slow build-up of the story was well-handled and added to the suspense, and the last 45 minutes has some surprises and is indeed chilling. It is indeed an unusual film and certainly one of the finest that I've seen. In fact, I heard that Universal wanted to change the ending of the film but Clint and Don Siegel were like "no" and managed to stick to their guns. Plus, Clint did the film because he wanted to play a dark character. This review has really captured my attention, I like the unusual sound of it, will be giving it a watch. @vinnieh-Do it and then see Sofia's take on the story which will come out next month. When I saw the trailer for the remake, I didn't even realize it was a remake. This one slipped past me. I'm not a fan of Eastwood so I probably will just wait for the new one. (how often does that get said? lol) Great review! @Brittani-Thank you, I would actually recommend seeing the original as it is one of Eastwood's best films as an actor. Especially in seeing what Sofia might do with the story which I am excited for since I am a Sofia fanboy. I am going to watch this version soon and then see the Sofia Coppola interpretation. @vinnieh-Do that as Don Siegel's version is a must-see. This is one trippy odd duck of a film. So different from the standard Eastwood film of the time and an unusual cast all doing grade A work. Elizabeth Hartman was such a unique onscreen presence, her natural fragility adding many layers to her performances. Unfortunately that very fragile state was a terrible enemy of the actress greatly curtailing her career and life leading to a tragic end. She's memorable here. I'll watch Gerry Page in anything, sometimes to my detriment but by and large it's been rewarding and she's always marvelous. She and Eastwood did NOT hit it off behind the scenes leading to her deliciously pithy comment when asked "Yes I have acted with Clint Eastwood. Or rather, I have acted opposite Clint Eastwood." @joel65913-Yeah, I heard about what happened to her which is really sad while I also learned that Clint and Geraldine Page weren't kind to each other but did maintain their distance. I heard Jeanne Moreau was supposed to play the role that Page was eventually cast for but Universal wanted someone else. @thevoid99: Thanks for the bonus info about Clint and Don Siegel, I didn't know Eastwood wanted to play a dark character. Moreau would have been a fascinating choice but in this case I'd have to side with the studio. Not that she's not a brilliant actress but no matter what there is always something very Gallic about her and I'm not sure that would have made sense in the beleagued Deep South of Civil War times. Perhaps if it had been set in New Orleans it would have made more sense but it academic and Geraldine Page is wonderful so it worked out for the best. @joel65913-It was shot partially in and around Baton Rouge but I think shooting it around New Orleans wouldn't work as I think Don Siegel wanted to create something that is authentic in its look. It certainly sounds better than the crap which Sofia Coppola produced. @Diana-Actually, they're both completely different takes on the book. Siegel's is more lurid and creepier yet I prefer Coppola's because of its emphasis on isolation, temptation, and how it would disrupt the status quo. They're very different films. Then again, I'm a Sofia fanboy.